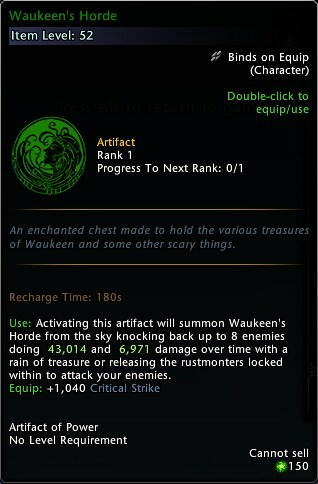 Waukeen Event: (+1040 Critical Strike) Rank 1 for Waukeen's Hoard? As that's the image they used showing (currently) +1040 Critical Strike, not +42 Critical Strike like it actually does, just search Auction house for it. Though the other interesting thing is the Damage shown is 43,014 + some DoT in addition to that. What it does not say however is the damage scales with your power; as I've seen it burst higher than 90k while looking at the (Uncommon) Artifact on Auction House; as my Paladin's Power spiked while being attacked. So perhaps the difference is it's the first Artifact that does not increase damage with Rank but instead with your Power! It may be no 'Soul-Sight' with it's Mythic (max) 50% damage boost for 10 seconds, but damaging up to 8 enemies with a Damage (Push) & a DoT with both that scale with your Power, so still a 'very' fine artifact indeed. While it's BUFFs values identified in the image above seems oddly mistaken, it's still 'albeit' a really 'good' artifacts with 'great' stats. I believe but can't confirm it's currently 'rumored' primary values are critical strike & armor penetration (1000) max, and I believe it's third (600) max is Power at Mythic. That's at least what I've 'heard' but it also just speculation until someone can confirm it. I'd appreciate if someone who had one would indeed confirm it's critical strike, armor pen, and power as the Buff's. Still I think the 6-8m opening Price was a fairly steep entry price into the market, as that likely 2-4x richer than 'most' at least are willing to pay. Yet strangely this "Waukeen's Hoard's Artifact, similar to the Gond Anvil of Creation, and the new Tymora's Spinning Coin Artifact; none are shown in collections page, which I thought was odd. The Siegebreaker's Banner is as a 'limited event' item, but availability may not mean limited time frame, just limited to earning only from the event; still that artifact is indeed in Collections. So maybe the new Gond &/or the Tymora, and even the Waukeen Artifacts will make collections soon. So forgive a little confusion? I think one 'may' have sold earlier Friday for about 2.2-2.4m, yet as the weekend began to wrap price climbed. Still considering it can take 1-3 hours just to acquire 64 Waukeen Coin Purses, so farming them is by no means a small task either. I'd suspect the Artifact is maybe a 5% Chance at best or not too much higher, but that's simply a guess as over the event you now see about 30 on Auction. Regardless if you want one it's likely going to require at least 256 - 1056 or more, as the Golden Chests require 64 Waukeen's Coin Purse just for a single attempt. Though their are some other items identified as Rare Fashion mentioned in the Event like [Golden Crown], [Golden Sleeves], [Golden Robes] and all 3 are actually [Epic] Fashions items; the 'Replica' Golden Pantalooms are still [Rare]. Would have been nice if R5 Shiny Coin had a 'slight' chance to drop from the normal Waukeen Stongbox that requires '8' Waukeen Coin Purse; and may have even been nice if the Waukeen's Treasure Chest offered the Rank 5, so the Waukeen's Golden Chest perhaps offered perhaps a Rank 7. Still upgrading a R5 Enchantment isn't that hard, and I suspect they didn't want to flood the market with them either--it's actually just nice to see a new Enchantment for sure! My only question was related to the Waukeen EVENT show in the Minibar. In the game event details it lists, "There you can exchange them for a [Waukeen's Strongbox] or even a [Waukeen's Treasure Chest], each of which will have a better chance for a greater reward." Still it list nothing about the new Golden Chest or what it contains and perhaps why I think many at least yesterday were selling their Waukeen's Purse, though perhaps today a few more may choose to hold onto them. Perhaps a future event will see this in game event updated with all rewards. I went to AH and I see +42 critical Strike right now.